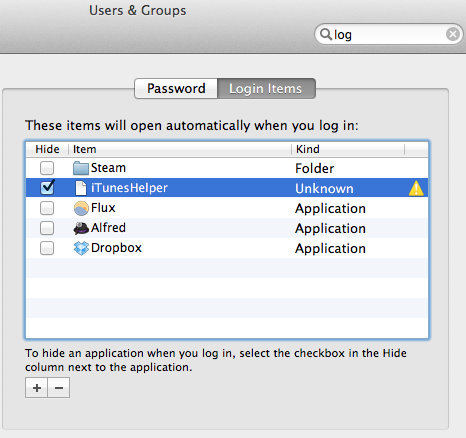 What is the yellow warning sign in the “Login Items” Tab under the “Users & Group” System Preferences? I was deleting Skype from my login items and noticed that iTunesHelper showed a warning under a unmarked column. What does it mean and how do I fix it? Right-click on it, and select "Show Package Contents". In High Sierra, it's often a permissions problem (e.g., Fastscripts tries to add itself, which is somehow not allowed). If you know where to find the application, delete the one with the warning and drag in a new one manually. Not the answer you're looking for? Browse other questions tagged login-items . How do I unhide and remove disk mounts from Login Items? How do I change the order in which login items execute under OS X 10.8.2?